It’s a commonly accepted fact of childhood that nothing is cooler than someone else’s stuff, whether that’s a lunchtime snack or a toy box treasure. And this most certainly applies to art supplies—it’s cool to make art at home, but even cooler when you’re using someone else’s gear. This is why my girls are regulars in the family art studios at the Walters Art Museum where there are glue-dots aplenty and clay that’s even cooler than play-doh. 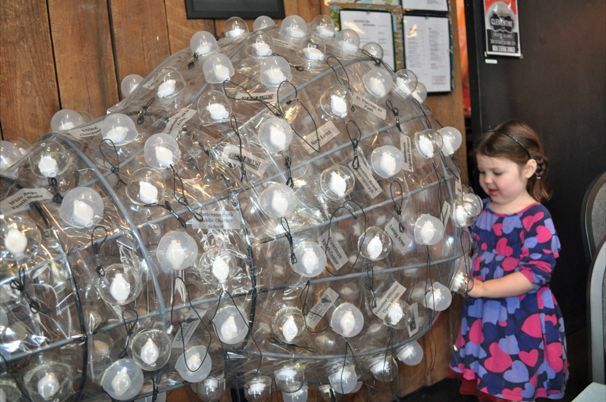 This year, I’m looking to branch out and explore more of the city’s family-friendly art programs. My daughters (3 and 4-days-short of 6) are on board if it means more glue sticks and scissors of different shapes and sizes. Last weekend, we kicked off our art tour at the Creative Alliance. Not familiar with the Creative Alliance? 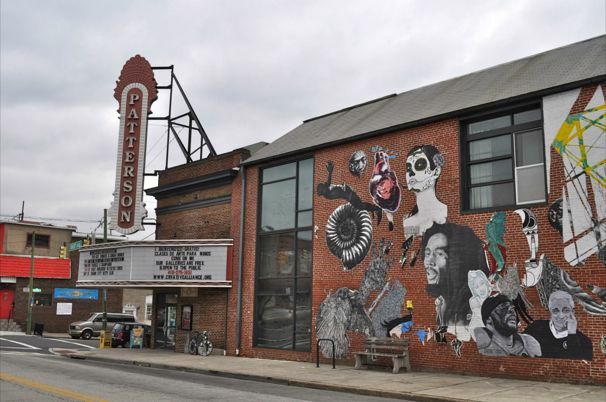 This multi-purpose arts center is housed in The Patterson, a renovated theater on Eastern Avenue in Highlandtown just a few blocks from Patterson Park. The weekly Kerplunk! 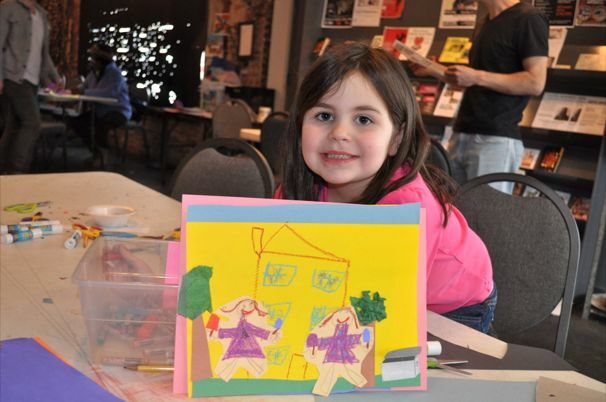 series is a drop-in family art program on Saturdays from 12:00 p.m. to 3:00 p.m. With some guidance, families may create sculptures, collages, and other masterpieces that tie-in to the gallery’s current exhibits. During our visit, we were invited to make a collage that reflected something important in our community, an activity that was related the exhibit on Black History Month featured in the second floor gallery. This open-ended project was nice because it appealed to a wide age range. Though a bit over my 3-year-old’s head, my kindergartener immediately decided to recreate a scene from a neighborhood Popsicle Night (a beloved tradition from our old ‘hood that we’re looking to introduce to our new neighborhood this summer). I imagine that older kids might have explored the deeper importance of what makes a community special beyond frozen treats. An instructor showed the girls a collection of sample collages as inspiration and they were turned loose to collect supplies and get to work. The vibe was relaxed. While friendly instructors checked in to see how things were going, the girls were free to create at their own pace. For Millie, this was 10 minutes with a glue stick and some crayons and she was ready to move on. 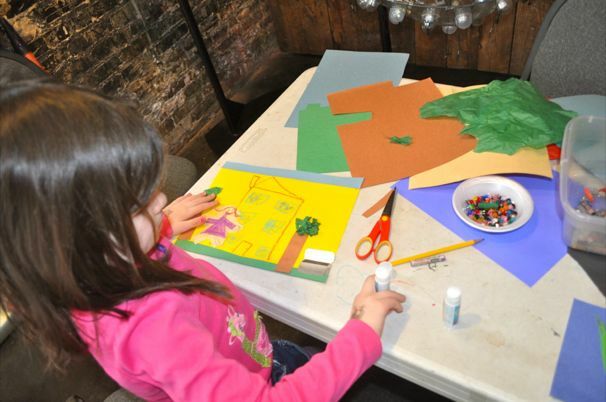 But Olive worked methodically for a half-hour, using all of the supplies at her disposal including scissors, construction paper, tissue paper, scraps of “fancy paper,” crayons, and glue sticks. The end result—a mixed-media collage with tissue paper trees and cut-out characters of her and her sister enjoying popsicles on our front lawn. hundreds of miniature LED lights. The girls were encouraged to climb under and around it searching for LED lights that still worked to illuminate this jumbo lantern. In the main gallery was a light exhibit that became a wide-open dance floor for the girls as the bopped around under the blinking lights. 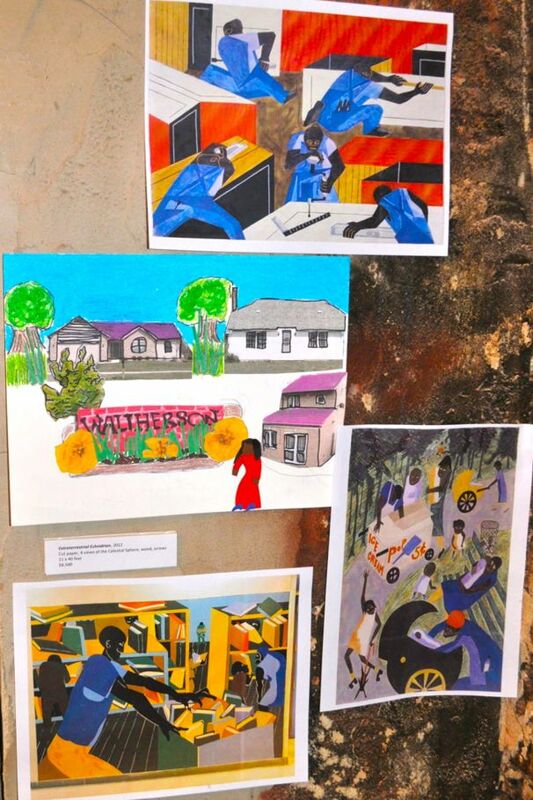 Upstairs, we checked out the prizewinners from the Black History Month Competition sponsored with Johns Hopkins. Then we peeked down the hall to the studios where the Patterson’s Resident Artists work and live. Olive was thrilled to meet a “real-life artist” who ducked out of his studio to say hello. You can check out Kerplunk! on Saturday afternoon through March 24, 2013 when it will take a hiatus before the summer series begins. Visit the website for more details on this and other family-friendly programming. We’ve got our eye on the upcoming live action dog comedy show “Mutts Gone Nuts!” which sounds like an extended, live YouTube clip of hilarious dog antics. This show is on Sunday March 3 at 3:00 p.m. and requires advance tickets ($12 for adults, $7 for kids and members). Finally, the Creative Alliance does not have a parking lot, so you’re on your own to find street parking. We found a spot on our first loop around the block with no problem. (cool) tips: Drooling over the menu displayed at the Creative Alliance’s on-site outpost of Clementine? Sadly, the restaurant is not open during Kerplunk!. But you can head across the street to Highlandtown favorite Matthew’s Pizza for one of their legendary thick-crust pizza pies. Hello Jenn! Great meeting you and your family at Kerplunk! Here at Creative Alliance we really appreciate you coming out, and your write up about the class and space is wonderful. We appreciate your time showcasing some great Baltimore art, and we hope to see you and the fam. soon. Thanks soo much Jenn! We really appreciate your write-up and you got everything out of your Kerplunk! 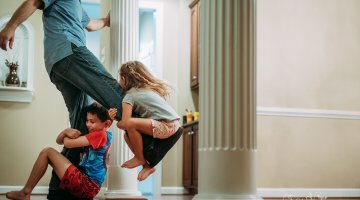 experience that we were intending: art time with your daughters as well as exploring the all the things that the Creative Alliance has to offer. Additionally, would you mind if I sent you a couple of questions that I’m asking our Kerplunk!ers in order to get feedback for a case study that I’m writing?